Gujarat Fortune Giants put in a complete performance to thrash Patna Pirates 45-27 in their encounter at the Thyagaraj Sports Complex in New Delhi. The Fortune Giants executed their plan to perfection and did brilliantly both in attack as well as in defence to decimate the three-time defending champions. The game started with Gujarat on the front foot as they took the lead 3-2 in the second minute of the clash thanks to a smart raid from Dong Geon Lee and never relinquished the advantage from that point onwards. While their raiders kept knocking off points, the defence from the men in Red and Yellow was at its best against the Pirates as they gave no chance to their raiders, using their strength and physicality to great effect. By the 10 minute mark, the Fortune Giants had increased their lead to eight points as they made the score 13-5. Patna tried to get back into the game using Deepak Narwal's raiding as their weapon but the Gujarat defence held on strongly to end the half at 20-12. The second half saw the Fortune Giants continue their dominance and extend their lead further as Parvesh in defence and Sachin Tawar and Prapanjan in attack were relentless, scoring point after point at every possible instance. They began the half on a great note, securing an all out in the second minute of the second half to take a 26-13 lead after Vikas Jaglan was tackled with ease. The next six minutes saw a purple patch for defenders from both teams as no raiding points were scored, with teams trading tackle points to take the score to 30-15 at the nine-minute mark. As the match looked to be petering out with Gujarat firmly in control, Sachin provided a brilliant moment as he affected a great raid, taking out three defenders. That made the score 38-21 with four minutes left on the clock. However, they were not done there as reserve raider Dharmender also scored three points on a great raid, causing an all out, and making the score 43-22 in his team's favour. The Fortune Giants defence held firm till the end to seal a 45-27 triumph. Sachin Tawar and Prapanjan were excellent in the raiding department for Gujarat Fortune Giants as they scored 10 and nine points respectively. His Super 10 meant that Sachin now has 127 points for the season in 16 matches, putting him at seventh among raiders with highest raid points. Parvesh Bhainswal put in another flawless performance as he scored eight tackle points, with 100% accuracy on his tackles. He is second among all defenders with 64 tackle points. 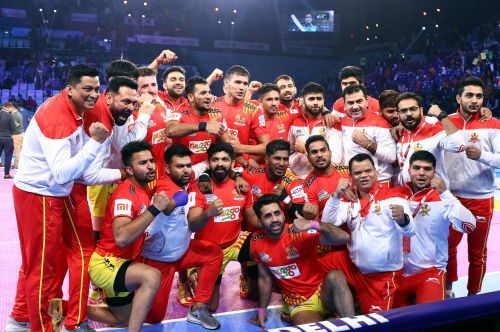 Two-time Most Valuable Player Pardeep Narwal was rendered ineffective by the Gujarat defence as they allowed him to score only one point in the entire match. They tackled him quickly and decisively and never gave him the chance to use his famous moves. The result strengthens Gujarat Fortune Giants' title credentials and takes them to 68 points, four behind Zone A leaders U Mumba, with a game in hand. Patna Pirates, on the other hand, lose ground in their pursuit of Bengaluru Bulls in Zone B, as they remain on 46 points, eight behind the leader. Show your support, buy official Gujarat Fortune Giants merchandise online on Souled Store. 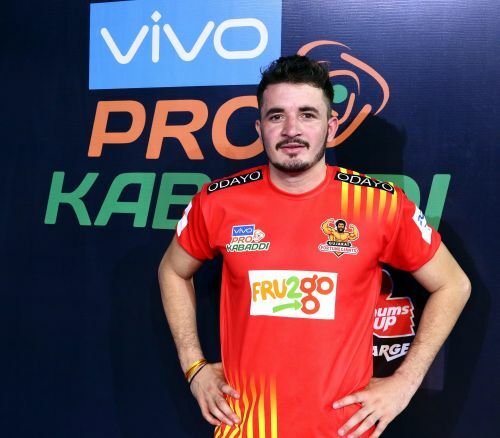 Follow Sportskeeda for all the latest Pro Kabaddi 2018 news, updates, schedule and live scores.